Nearest: Tube & Railway Station: London Euston 0.2 miles (0.3 km), DLR Station: Tower Gateway 2.7 miles (4.3 km), Motorway: M1 Junction 1 5.3 miles (8.5 km). The 6 tube stations and 4 railway stations in a half mile radius (0.8 km) of the hotel means transport links are excellent. The Premier Inn Euston London Capital is situated on the Northern border of central London on the junction Euston Road and Dukes Road. A very short walk from Euston mainline station (5 minutes) (opposite on North side of Euston Road) and close to mainline stations at St Pancras and Kings Cross. Close to the popular market at Camden Town and the shopping centre in Bloomsbury. The Euston Road is a very busy main road, one of the busiest in London. Kings Cross/St Pancras Station (10 minutes walk) is the London terminus for the Eurostar service to France and also on the Piccadilly line which means tube links to Heathrow Airport with no changes. Nearest attractions include the British Library (0.1 miles), Egyptian Archaeology Museum (0.3 miles), The Foundling Museum (0.3 miles), Regents Park (0.7 miles), Madame Tussauds (1.1 mile), London Zoo (1.3 miles). One of the first new generation Premier Inns that was originally branded as a Metro Premier. The Premier Inn Euston offers satellite TV, hairdryer, telephone/modem point and shower gel, air-conditioning, Ironing Facilities, Tea/Coffee Maker, Radio, Fax point, Alarm Clock, Heating and Work Desk. All rooms have free WiFi. Rooms are en-suite with shower/bath. children considered as being 15 or under. 2 Children and 2 adults are accommodated within family rooms. The hotel features a Slice restaurant (traditional and contemporary dishes) and bar onsite with a contemporary decor. Each morning the hotel serves a buffet breakfast with options for cooked items and continental items. Evening meals also served. The front desk remains open 24/7 and the hotel offers luggage storage facilities. Lift within hotel. The hotel features wireless internet connection. The Premier Inn Euston does not permit smoking in area including the bedrooms. There is some limited parking available. The hotel is just the wrong side of the Euston Road in terms of the congestion charging zone which means its payable at this point. Premier Inn St Pancras: is 255 yards (233 metres) away, has a guest satisfaction score of 89% and rates start from about £65. Premier Inn Kings Cross: is 0.4 miles (0.6 km) from here, earns a customer rating of 89% and base rates begin at about £133. Premier Inn Holborn: 0.7 miles (1.2 km), rated at 90% and with rates from around £107. Premier Inn Angel Islington: 1.1 miles (1.8 km), rated at 89% and with rates from around £176. Compared to other London hotels: This hotel has been rated 89% by past guests. The London average is 80% and the average for 3 star hotels is 76%. Therefore this hotel is well above average for its sector (star rating) and for London as a whole. Premier Inn Hotels across the chain average 85% so this hotel is one of the better rated Premier Inn hotels. Milesfaster ranking: 80th from 866 London hotels, 26th of 65 Premier Inn Hotels, and 5th of 329 three star rated hotels. Something close by with a great client rating? We suggest the 4 Star Amba Charing Cross may well be of interest to you being 2.0 miles (3.3 km) from the Premier Inn Euston. The Amba Charing Cross has an extremely high guest rating of 98%, one of the best rated London hotels. 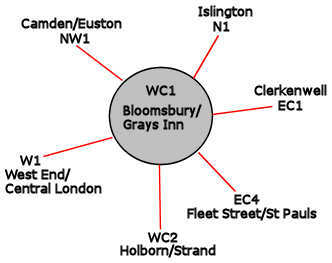 The fifty closest hotels from here (1 Dukes Road, WC1 postcode) that we have data for cover a 0.6 miles (1.0 km) radius. The 50 are made up of 3 five star hotels (average rating 89%), 18 four star hotels (average rating 81%), 19 three star hotels (average rating 76%), 8 two star hotels (average rating 71%) and 2 one star hotels (average rating 62%). Top 3 star hotels are Premier Inn St Pancras and the Arosfa Hotel Bloomsbury (both 90%). Coming out as the top rated hotel is Montague On The Gardens Hotel (4 star) at 99%. Base Rates: Using base rates we analyse average starting rates for the area. Useful as a guide but note they do not include special offers or short term deals. The average rate for all the 50 nearest hotels is £96 per night. Starting from £16 at Generator Hotel (2 Star, 77%) up to £222 at Renaissance St Pancras (5 Star, 89%). Averages by star rating: Five Star average: £193, Four Star average: £122, Three Star average: £77, Two Star average: £56 and One Star average: £53.